Christmas has always been a joyous occasion for me, but I know not everyone shares my enthusiasm. My biological Father, a bipolar atheist, despised Christmas. While families gathered around their hearths and spruces, passing bowed packages to-and-fro, my Father tossed soiled garments into warm suds. Joy to him meant a surplus of vacant machines at the laundromat. My parents divorced close to my birth. My Dad visited sporadically, so I only have one memory of sharing Christmas with him. I was an adult. We were visiting my brother, Keith, in Virginia. That holiday a cloud of depression fell on my Dad like an avalanche. One night, while playing board games, we listened to a Christmas CD I gave my brother. Over and over again. This grated on my Father's last fragile nerve and he wasn't shy about letting us know. He finally shouted: "Will you turn that &? *#* music off!!" Who knew Christmas carols could cause such a visceral reaction. I love Christmas carols. But I am not a bipolar atheist. It was difficult for me to comprehend my Father's contempt for a holiday that brought us such joy. 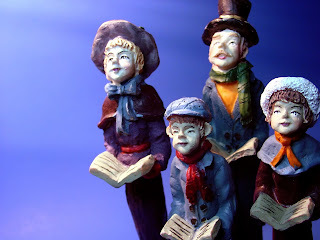 We loved to canvass the neighborhood at night, touring the lit decorations adorning snowcapped lawns. His lifeless eyes turned away. We translated each heavy sigh into an audible, "Bah hum bug." We all walked on eggshells that Christmas, hoping the cloud would dissipate soon. It didn't. I realize sorrow can fill people's hearts during this season like stocking stuffers, leaving no crevice for peace, hope or joy. Now, more than ever, people are feeling hopeless, dejected and despondent. With the ongoing recession causing a tidal wave of foreclosures and joblessness, marriages and fragile souls are being crushed in its wake. It's no wonder suicide rates are at an all time high. Heavy-laden hearts wish Christmas would come and go as rapid as a freshly fallen snowflake melting on a toddler's tongue. Centuries ago, Poet Henry Wadsworth Longfellow felt this way. Abraham Lincoln had just been elected President, giving hope to many in the nation. But things soon turned dark for America and for Longfellow, personally. In the summer of 1861, tragedy struck his family and he became severely depressed. He, his wife Fanny and their five children lived in the historic Craigie House in Cambridge, Massachusetts, overlooking the Charles River. It was a balmy summer and seven-year-old Edith complained of her long hair, so Fanny decided to trim her beautiful curls and preserve them in sealing wax. As she melted the bar of wax, a few drops fell unnoticed on her light summer dress. A breeze from an open window gusted through, billowing her dress into the flame, immediately engulfing her in fire. As a frantic Henry tried to extinguish the flames, he suffered severe burns on his face, arms and hands. Fanny died the next morning. Too ill from his burns and grief, Henry did not attend her funeral. That first Christmas after her death, Longfellow wrote in his journal, "How inexpressibly sad are all holidays." A year after Fanny's tragedy he wrote, "I can make no record of these days. Better leave them wrapped in silence. Perhaps someday God will give me peace." In 1862, the Civil War escalated and the death toll from the war began to mount. In his diary that year, Longfellow wrote of Christmas, "A 'merry Christmas,' say the children, but that is no more for me." In 1863, Longfellow's son, who had run away to join the Union Army, was severely wounded and returned home in December. There is no entry in Longfellow's diary for that Christmas. As Longfellow came to the sixth stanza, he paused and pondered the condition of his beloved country. The Battle of Gettysburg was not long past. Days looked dark and he probably asked himself, "How can I write about peace on earth, goodwill to men in this war-torn country, where brother fights against brother and father against son?" But he kept writing and what did he write? That could be say of our day as well. Whatever our circumstance, may we never forget the true meaning of Christmas. In the darkness of a tumbledown stable, Jesus was born to bring peace, hope and joy to weary, broken and heavy-laden hearts.